Often, we as trainers and dog owners introduce dogs to muzzles for serious situations. A dog is reactive on leash, fearful toward strangers, phobic of veterinary procedures, or is subject to breed-specific legislation. All of these situations are appropriate, if not encouraged, uses for muzzles. But none of these situations signals something so critical to muzzle training and a dog’s associations to muzzles: Fun. The primary goal when muzzle training is to develop a dog’s positive conditioned emotional response (CER), which is the technical term for a dog’s association (positive or negative) to a stimulus. For example, a dog who is uncomfortable being handled by strangers may develop a negative CER to the veterinarian’s office. On the other hand, a dog who has been trained to love handling and has a history of receiving high-value rewards during vet visits may develop a positive CER. The above image, created with help from Jean Donaldson and The Academy for Dog Trainers, illustrates the positive CER we build through a standard muzzle training plan. The presence of the muzzle, and the placement of the muzzle on the dog’s body, always results in a high-impact, high-value reward (in most scenarios, food). 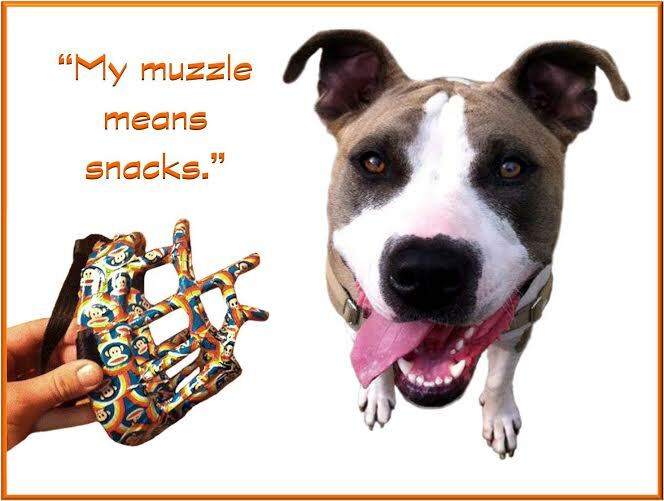 In the world of dog math equations, we’re teaching the dog: Muzzle = snacks. While this initial training is critical to getting your dog comfortable wearing a muzzle, it’s important continue pairing the muzzle with fun, rewarding scenarios for your dog. Why? Because dogs are masters of association. I once encountered a client who had muzzle trained her fearful and leash-reactive dog to perfection. Yet, the dog was still visibly less comfortable with the muzzle on. After some brainstorming, the client told me the dog only wore her muzzle when in the presence of strangers or on leash walks among other dogs. Even though the client always paired the muzzle with a massively rewarding treat, the dog had made the connection that the muzzle also equaled the transition to a more stressful environment: on leash, among other dogs. We tackled this problem by going back to the original goal: building a strong, positive CER. The client started putting the muzzle on her dog for short periods during low-stress, enjoyable scenarios: cuddling on the sofa, mealtime, playtime with her children. This extra training not only built a stronger CER, but also ensured the muzzle was no longer a surefire tip-off to stressful scenarios. The Muzzle Up! Project is not only about muzzle education and safety, but also muzzle creativity. The following are a few ways to make muzzle training and wearing a joyful experience for you and your dog. Remember, these are a supplement to the standard muzzle training plan. (Enjoy these exercises once your dog has gone through the plan and has a strong positive CER to wearing the muzzle.) Get creative with your dog’s math; Muzzles = snacks, affection, meals, playtime, and anything else your dog finds rewarding! – Muzzle Mealtime: Put the muzzle on your dog. Instead of a treat, feed her breakfast or dinner for a new, very high-value reward! – Muzzle Tug: If your dog’s basket muzzle fits properly, your dog will still be able to play with certain bones and tug toys that can fit through the openings in the basket. If you own a dog who gets a thrill out of tug, occasionally play the game after putting on her muzzle. – Muzzle Cuddles: It’s important for your dog to be able to settle while wearing a muzzle. Practice putting the muzzle on your dog, and sitting with her by her bed or, if she is allowed, on the sofa. Give her treats intermittently, as well as her favorite massages, for several minutes.